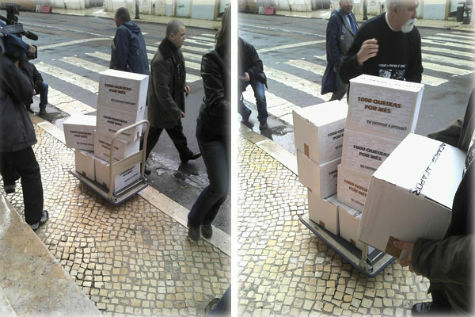 Wearing "Piracy is Illegal" T-shirts and carrying several boxes of complaints against file-sharers, a group of movie industry representatives showed up at the Attorney General's Office doorstep in Portugal this week. By clogging the judicial system they hope to raise awareness of widespread online movie piracy. However, this ideal may backfire as the local Pirate Party believes that the actions of anti-piracy activists may very well be illegal. ACAPOR is without doubt the most active anti-piracy outfit in Portugal. Last year the movie industry representatives made the news when they filed a complaint against The Pirate Bay with the General Inspection of Cultural Activities, a department of the Portuguese Ministry of Culture. The group asked for The Pirate Bay to be censored in Portugal through an Internet filter, but instead their actions led to the uncensoring of their internal communications. As part of Anonymous’ Operation Payback, ACAPOR was shamed when their website was hacked, revealing hundreds of personal email messages in the process. Despite this setback ACAPOR is continuing their quest undeterred. Two weeks ago the group announced that it would overload the judicial system with complaints against file-sharers in an attempt to raise awareness of the devastating effect they claim piracy has on their industry. And so it happened. This week the group personally delivered several boxes of complaints to the Attorney General’s Office, wearing T-shirts with the slogan “Piracy is Illegal.” The movie industry group claims to have gathered 970 IP-addresses of ‘illegal’ file-sharers and is demanding action from the authorities. In addition, 30 complaints were ‘filed’ containing the IP-addresses that republished the emails that leaked after the Operation Payback hack. However, as with their previous revolt against The Pirate Bay, it may be that ACAPOR are the ones that will be embarrassed. Shortly after the group delivered the boxes to the Attorney General’s Office, Portugal’s Pirate Party came out with a statement claiming that ACAPOR’s actions are illegal. The Pirate Party says that ACAPOR is not authorized by the National Data Protection Authority to collect IP-addresses as evidence, and has decided to file several individual complaints. In addition the Pirates have filed a criminal complaint for gaining improper access to the Attorney General’s Office. The Pirate Party argues that ACAPOR’s actions violated the privacy of 1000 ordinary Portuguese citizens and hopes that the responsible authorities will take the necessary actions to prevent this from happening again in the future. ACAPOR was quick to deny the allegations and its President believes that no laws were broken. Time will tell who’s right.